A light and lively Armagnac worth remembering. Delord House got its start in fine entrepreneurial spirit when Prosper Delord built a portable alembic still that he drove from farm to farm as a contract distiller for local wineries. Business was good, but his sons — Gaston and Georges — brought the operation in-house, establishing their own brand — Armagnac House Delord Freres in Lannepax, France. The business is still independent and all in the family with Prosper’s great-grandsons Sylvian and Jérome running operations and marketing. They are an estate producer of premium Armagnacs with their own vineyards, distillery, aging cellars, and even bottling on site and all done by hand. Delord has a huge standing inventory of Armagnac and they have kept meticulous records about which cask is which. This allows them to release special vintages and limited editions on a regular basis. 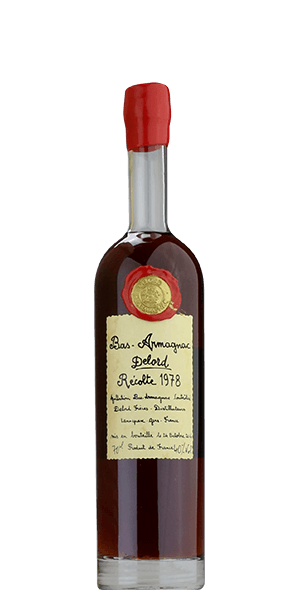 Bas Armagnac Delord Recolte 1978 is guaranteed to be from the 1978 vintage. The “Bas Armagnac” refers to the region where the grapes were grown — there are three plantation areas where official Armagnac can be produced by law. And if you are keeping track, the grapes used are limited to the classic combination of Ugni Blanc, Folle Blanche, and Baco varietals used in some of the best Armagnacs. And we love the old-school presentation in a wooden crate and wax-sealed and frosted green glass decanter. What does Bas Armagnac Delord Recolte 1978 taste like? The Flavor Spiral™ shows the most common flavors that you'll taste in Bas Armagnac Delord Recolte 1978 and gives you a chance to have a taste of it before actually tasting it. It is a classic, rich, 1978 vintage Bas Armagnac with a long woody finish. Classic brandy. Nice nose. Nice finish. Red wine drinkers, rejoice!